If you search your ancestors in Reggio Calabria, Calabria, info about your Italian family are stored in the City Office archives or at the parishes. In towns and villages of Calabria and in Reggio Calabria province registry offices were established in early 1800: it means that you could find information in Reggio Calabria registrar as of that date. So, if your ancestors were in Reggio Calabria in the nineteenth or twentieth century, then you could try to contact the City Office of Reggio Calabria to know more. 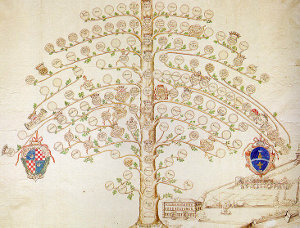 Before to start your genealogy research in Reggio Calabria, we suggest you to read our tips for your search . They are useful to search in Calabria and in Reggio Calabria too. Next picture shows the demographic trends in Reggio Calabria from the Italian Unification (1861) an important info to understand how many people lived there in the past. It could be important to know if the last name you are investigating is a frequent surname in Reggio Calabria. As more your surname is common in Reggio Calabria, as more it could be difficult to find the right info about your ancestors in Reggio Calabria archives if you have not exact dates. If you have the opportunity to visit Reggio Calabria and Reggio Calabria province, you could plan to investigate churches’ archives by yourself, but from abroad is very difficult to obtain any result unless you find a reliable local help. If your research is in a dead end and you need professional help from our local Italian genealogists write to reggiocalabria@italianside.com our expert in Reggio Calabria area will study your request and will reply to you with a research plan and a quote. I am looking for my father’s family. He was born in Pallizzi and was brought to the US as an infant. Their a Italian last name was Stellatano, I believe, and was changed to Stellone. Their was a Brother who returned to Pallizzi and had more children . If anyone has any information I would appreciate it. I am researching my ggrandfather Antonio Romeo. He was born 26 Sep 1883 and his birth was registered in Gallina. Family lore says actual home was in Ravagnese. His father was Pasquale and he died before 1922. His mother was Antonia Prattico. Antonio had at least two brothers who also came to the US. Francesco, born in 1889 also emigrated to the US permanently. There was another brother, Giuseppe who was in the US in 1925, but then disappears. Can not confirm death or return to Italy. I know that Romeo is a very common name in that region, but am hoping to someday connect with distant family there. I too am researching the Romeo’s. I’ve found quite a lot of info. I dont believe we are directly related but maybe distant. My grandparents were Maria Rosa Romeo( 1908-1998) and Antonio Giuseppe Ciro Fabbrizo Bova. (1892-1950). My great grandparents were Giuseppe Maria Romeo (1879-1964) and Maria Rosa Romeo (1885-1948). They were first cousins. As far as I know they originated from Plati. I am looking for information on my grandfather and his family. Francesco “Frank” Daniele was born on June 17, 1891, in Torre di Ruggiero, Catanzaro, Italy, to Maria Grazia Caterina Pirroncello, age 22, and Domenico Nicolo Daniele, age 30. 17 Jun 1891 • Torre di Ruggiero, Catanzaro, Calabria, Italy. Francesco “Frank” Daniele died on December 2, 1980, in Cambridge, Massachusetts, when he was 89 years old. I am in Australia and looking for any descendants of the Ielasi family from Plati & Careri. Word has it that all Ielasi’s are related and all descendants stem back to 2 brothers. My Great-Grandfather was Domenico Ielasi married to Maria Policano…came to Australia in 1937 – they had 7 children. I am looking for Guiseppe Intrieri but it could be Iaria born 1879 in Calabria. His wife was Rosa Silicy(maybe) 1888. They came to US and changed their name to Joseph & Rosa Winters. I am searching for mai family in Italy. I am looking for info on my Grandfather, Louis or luigi who immigrated to Ottawa Canada, thru New York in 1905, with 3 brothers and one sister. Born in Spezzano Piccolo in around 1880. I am at a dead end, I can’t find my family at all in Reggio Calabria (Where apparently my family is from) I have a great great uncle who stayed in Italy, but I can’t track them down. When my family came to America they apparently change their last name and NO ONE knows what it orginally was. I found a letter from my great great uncle and I was able to trace back the address in Giora Tauro. any idea what I should do next? I tried to look for my great great grandparents, but it was as if they never existed, I can’t find any record on them. The last name they came to America with was Capalario. My name is Domenico minici I’m looing for my great great grandfather was born in Gioiosa Ionica Reggio calabria, my grandfather was born in Gioiosa Ionica Reggio calabria in 1910 .I wou like to know. where there living at.Please Reply. Domenic minici.Canada. toronto.Ontario. My Great Grandfather came to NY in 1903. His name was Antonino Putorti. He left his wife Anna Brescia and children Julia, Domenico and Maria in Gallina, Calabria. He brought them to NY in 1907. I have been trying to find information about his Parents and siblings. I have been researching for 14 years and have gotten no where. It would be wonderful if I could get any information. Thank You. i am traveling to Reggio, Calabria from St. Louis, MO (USA) in a couple of weeks. My mother was born there in 1911. Her name was Giovanna Zerilli. She was the daughter of Cosmo Zerilli and Grazia Buffa Zerilli. They later lived in Marsala and Mazzara. In 1920 the family moved to the U.S. If there are any living family members in Calabria or anywhere in Sicily, I would like to know how I can locate them. My great grandfather was born in Nyc in 1898. He said his birthday was august 15th The feast of the assumption. At one his mother took him back to callabria italy until he was 16 he immagrated back to us thru nyc and settled in Cleveland ohio. His name was joesph myer stated his italian surname was Muraro. I found that mrans mason. I don’t know if that was our family name and my father has tried to look into as well with no luck. Any help? I belive he was in the italian army before he immigrated and died in 1978. Thank you. He lived his whole adult life in maple hts ohio. Hello. I will be visiting Reggio Calabria in 3 weeks and I am curious to know if my ancestors are from Reggio Calabria. My Grandfather was Rocco Riggio (1902-1967) and immigrated to the US (through Ellis Island) Oct 6, 1923 From the port of Palermo on the SS Providence. His Father, my Great Grandfather was Luigi Riggio (Reggio) and I believe he immigrated to the US in 1912, from the port of Palermo, and his last known place of residence was Bordonaro Sicily (I think. Not sure about that part) I am desperate to find any piece of my family history that I can, especially if it’s a town or place I can visit, as my Father, Louis Riggio (1939-2005) has passed and I always said I would go to his homeland for him. He was a first generation American with strong Italian roots and a love of Italy that he passed on to me. Any information you could find would be greatly appreciated. Thank you. Looking for information on gr grandmother Paolina Marra. Born approx. 1870 to Patsy Romeo and Angela Surucia. Married Pasquale Antonio Marra. Children: Carmelita, Anna Rosa, Nicholas, Antonio. Immigrated from Reggio Calabria to United States, then Canada.Possibly at different times. thank you! My Great-Grandfather came to the US approx 1870s, before there is much information in the US. Biggest problem is that no one living knows this Italian surname. In the US, he became Mike Livery. He married here and had a large family. Any suggestion for how I should proceeds. He is the only part of my Italian family that I have not found more information on. i am looking for my Italian ancestry. My great grandfather is an Italian national who lived and died in Brazil, his name is Fedelis Gravi (Father: Vicente Gravi, Mother: Geraldina Gravi). Please advise if you can assist us in locating his birth town and family in Italy. Hi my late father Rocco Vincenzo Minici was born in Roccella Ionica in 1919. I am searching for surviving relatives still living in Italy or elsewhere. Can you please help? Regards. Laureana Di Borello Reggio Calabria. Thank you, looking forward to some information. I am trying to find information on the Romeo/ Crucitti/ Crutrupi family from Reggio Calabria. I am looking for any family informaiton from the decendants of Sebasitano Romeo and his wife Margherita Cutrupi especially if anyone has any information? I am looking for lost relatives still residing in San Pietro en Guarano. My great grand father was Pietro Panza. He was born May 29, 1871, died October 20, 1925. He was married to Fortuna Ferraro who was born in May 1861 and died in October 1942. Both are buried in the Church cemetery in San Pietro en Guarano. I am trying desperately to find a copy of the certificate of marriage for my Nonni. I have no idea where to start, as I think they were married via proxy, when my Nonna was still in Reggio Calabria and my Nonno was in Australia. I am looking for information on Fortunata Marzano and Bruno Montegna. They are my great grandparents. They immigrated to the United States but have family in Reggio Calabria. Any help would be greatly appreciated. Thank you. I am looking to obtain birth information on my greatgrandmother born in Reggio Calabria. I am planning a trip there in feb/march and would love to know which offices to go to when I get there..
My great grandfather Louis Bottino came over from Reggio Calabria in 1913. I’m looking for any information on family members who remained in Italy. Fortunata Scarcella. We are trying to find records of his birth, baptism and possibly his family. he is our mystery link! My fourth great grandfather Paolo Foti was born circa 1805 in the city of Reggio Calabria. I wish to obtain his baptismal record and the marriage record of his parents, Luigi Foti and Orsala Cannao. What is the name and location of the Chiesa Madre in Reggio Calabria? I am interested in knowing more about my family who are from San Martino, Reggio calabria in Italy, My GGG Domenica Mammoliti, I am not sure who she married she had 2 husbands, and too, and I have I would like to know about her mother and father too ??? Trying to find relatives of my Grandfather, Savario Delfino, born 1881 in Reggio Calabria, Italy. He had brothers that we know of but don’t have their forenames. I am interested in finding relatives who may still reside in Calabria. The original spelling of my maiden name was Sciumbata, my maternal grandmother’s name was Talarico. they lived in Rizzuti. Also any information on my husband’s family, Fazio and Fioretti names, would be appreciated. Hope to travel to Italy someday and would LOVE to meet relatives! Thanks in advance for any assistance! My grandfather (Giuseppe’s father was Francesco Guzzi. his mother’s name I believe was Anna Arcuri. My grandfather has a sister Amalia. and a brother Albino who immigrated to Argentina. Looking for any info. Mthansk. Hi! I’m brazilian and i am looking for information about the parent of my grandfather. We believe what his name was Paulo Losapio or Paulo Lossapio or Paulo Lozzapio. Maybe he was living in Reggio Calabria. He immigrated to Brazil around 1880 – 1933. We really apreciate your help. Hi, I am looking for the parents of my grandfather Giovanni Mastella who was born in San Giovanni, Italy. Born on September 1, 1895. Also looking for siblings or any other family members. I have Mastella family in San Giovanni di Ceppaloni. My great grandmother was Lucia. She had two brothers Clemente and Domenico I believe and a sister Celeste. Would this be the family you are looking for? Looking for Annunziato Tripodi born and died in Serra San Bruno about 1830-50 married Roseria zaffino can I find? looking for any info on the surname Monarchio…. I know my father was Vito Degazio but born in 1917 in Canada I believe but his parents were from Italy and I also believe, Regio Calabria. If you would like to start a research in Reggio Calabria please send your request to reggiocalabria@italianside.com.